So about this time last year I told the tail of what I called the domino effect when working on my 1963 Galaxie 500 Sportsroof. Click here to read part 1 and part 2 of that saga. Here we are for part 3! As you’ll see in the photos the car was fitted with 2~ 8″ dia. electric fans on a shroud. The couple of times that I tested them they weren’t quite enough to keep the engine cool. Before you start telling me what I need to check, it’s a new aluminum radiator, new water pump, the timing has been checked, etc. 2013 wasn’t especially hot as the previous years and I had learned to avoid traffic to keep the heating issue to a minimum. So this winter I decided that one of the upgrades that I needed to get done was to get the car so that it would cool even if we get another scorcher summer. A quick check told me that the fans that I had were only capable of moving about 1300 cfm each. At anything over about 5 miles an hour this was enough to keep the engine cool so I knew it was close. A look around the internet and I found on Sumitt some Perma-Cool 8″ fans that move 2400 cfm each. Bingo! I raided my ailing savings account and ordered a pair up. The new 8″ fans that I ordered were a bit smaller than the other brand’s 8″ fans that were on the car. So these went to my Dad who needed some and I ordered up the 10″ units. The old fans pushed about 1300 cfm each and these new ones are 2350 each. Lesson learned, an 8″ fan from one company isn’t exactly the same as an 8″ fan from another. Since my dad needed some fans for a project he had going he bought them from me and I re-ordered some of the Perma-Cool 10″ units at 2350 cfm each, still a huge bump up from 1300 each. When they arrived I found them to be bigger than the originals. Damn. But I was able to place them on the shroud and cut the openings out larger to fit the new more powerful 10″ fans. Here’s the fan shroud without the fans in it. I scratched some marks to show where the new openings needed to be cut and enlarged the existing openings. Dad’s farm has a cat problem, but it has no mouse problem. Here my work was being inspected. After enlarging the holes with an air powered nibbler I brushed myself and the bench off and started mocking up the new larger fans. New mounting holes were drilled and the fans were temporarily mounted to the shroud. I test fit them in and all was good. Next step was to pull it back out, solder up the wiring to the existing wiring harness. I reversed the bolts from what is in the pics so that the bolt heads were on the radiator side, I covered them in some rubber bumpers to keep them from chewing up the radiator and side the whole assembly back together. I started the car and let it heat up. Found that it must have leaked something awful on the way home from Ryno Built’s shop awhile back. The driver’s side exhaust had some oil on it. After burning that oil off, no new oil was leaking (for now). I’ll re-check the manifold bolts to make sure that they aren’t the culprits this weekend. I ran the car for a good 15 minutes or so and it never got hot, the new fans kicked on and I could certainly feel the fans pulling through the radiator from the front side. We’ll see what happens on the way to the Lonestar Roundup. 1 week until we leave. If I have time this weekend I will upgrade the headlights and taillights to make sure I’m more visable. If you want to this blog in your email inbox each time the blog goes live, go on up to the top right hand corner of the website and enter your email address. The last day of each month I randomly pick 1 subscriber to win a prize package. 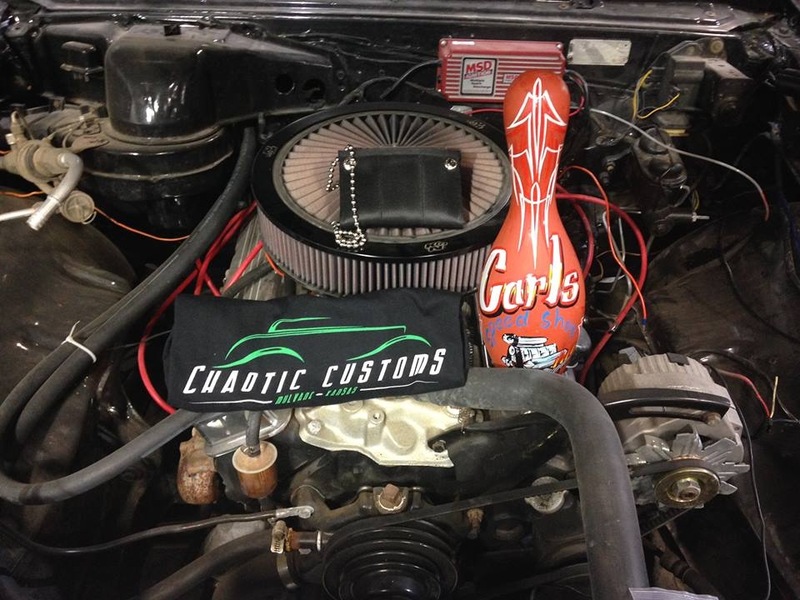 This month’s prize is a prize package from Chaotic Customs (shown below), a Royboy Knit Winter Hat & a shirt from Stray Kat Kustoms!